If you have either an inside or outside job that requires you to work at medium height then podium steps hire equipment should be ideal for your needs. All too often access towers and equipment for working at height are bulky and difficult to erect. In addition to problems relating to size and construction, most access towers are governed by strict regulations regarding erecting towers and working on them. Podium steps hire equipment is not governed by the same rules as other towers and this equipment is ideal for the individual working on a private project. Most access towers are a collection of tubes along with a working platform that have to be carefully fitted together every time the tower is erected and taken apart when the tower needs moving. Some towers are difficult to move from one place to another and businesses and those working on construction sites tend to prefer mobile access towers were possible as they can be moved without having to be deconstructed. Podium steps hire equipment require little or no setup and can simply be folded away when not in use, which makes them ideal for small and ongoing jobs. If you need to paint a wall or hang some wallpaper then podium step hire equipments is tailor-made for these types of jobs. Podium steps are especially useful when you have to work in small or narrow spaces as they take up little more space than your average ladder but are much safer to work on. 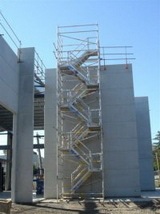 Podium steps are quite compact, especially when compared to other types of access towers. The steps can simply be folded away when not in use and they can fold down to a degree that means they can be transported from one place to another via an ordinary car roof rack. Podium steps hire equipment has rubber castors and feet at the front. The castors on podium steps make it easier to move from one place to another when you are working and require little or no effort to set up. Podium steps hire equipment is made from one piece with a platform that you can stand on to work. A podium has built in climbing bars and steps, which means there is nothing that needs slotting together and checking on a regular basis for safety reasons. The components of podium steps are welded tube to tube so there is little chance that they will come apart while the equipment is in use. Podium steps hire equipment is made out of two inch industrial scaffold tube and the integrated platform is 600 mm wide by 600 mms long and the whole thing folds flat when not in use. When you are working with the steps you can reach the platform by two fixed steps, the platform has a lockable gate for extra safety. Podium steps hire equipment is used to carry out smaller jobs on construction sites across Britain and is preferred for its easy of use and the fact that it is so simple to just stow away.